The H Factor: Scott Johnson's Fourth Graders Reading Has Gone to the Dogs! Scott Johnson's Fourth Graders Reading Has Gone to the Dogs! Well, what are you waiting for? Read to me! Just through the front door in a little alcove in the corner is a special spot reserved for reading- and frankly, it's gone to the dogs! "Five Little Monkeys" is a favorite with everybody- dogs included! That's because this is the place where fourth graders regularly read to dogs. Dogs like Sasha (a puppy who has a taste for comedy and adventure) get to listen to their favorites while the students hone their skills by reading aloud. Hello there- story time! Sasha is ready to listen! Let's do this! Amber is ready to read! The mission of READ (Reading Education Assistance Program) is "to improve the literacy skills of children in a unique approach employing a classic concept: reading to a dog." The program has been going strong for years, and hundreds of kids have participated. Sasha and Diane Carpenter are one of the several reading teams. 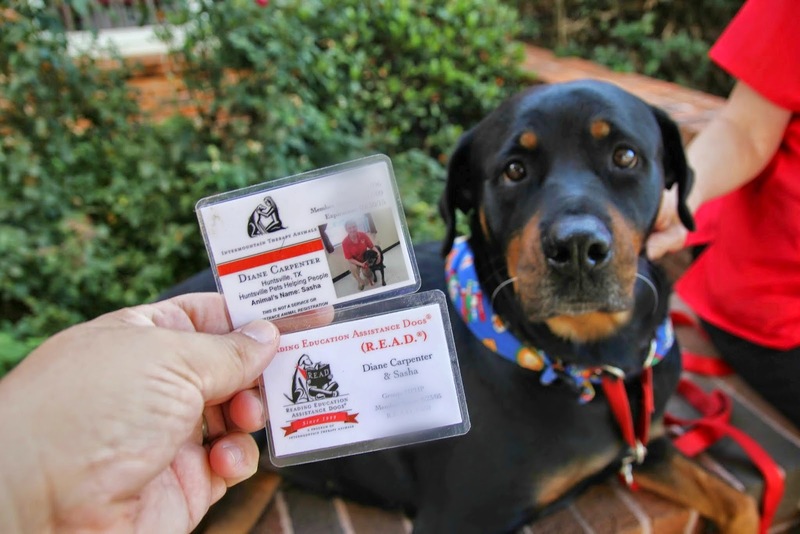 Each dog is a registered therapy animal, and READ is one part of the Huntsville Pets Helping People organization's outreach, so you may see some volunteer teams at the hospital, or assisted living and retirement homes in the area, too. But make no mistake, the only people reading to these dogs are these fourth graders. OK, you check out- thank you! Sasha and Millie are among the several dogs that visit. Think of these stickers as Sasha trading cards you can wear! In Huntsville, the group is made possible by Target (Huntsville Pets Helping People is a Target community partner). Thanks also go to individual donors including but not limited to the Suzanne Huber Foundation, Subway (Donice Wade, Owner), Innovative Charitable Solutions, Inc., the YMCA and Huntsville Memorial Hospital. Huntsville Pets Helping People is a local non profit organization affiliated with the Intermountain Therapy Animals as well as Reading Education Assistance Dogs.